Allergic to nuts or want to try something different? 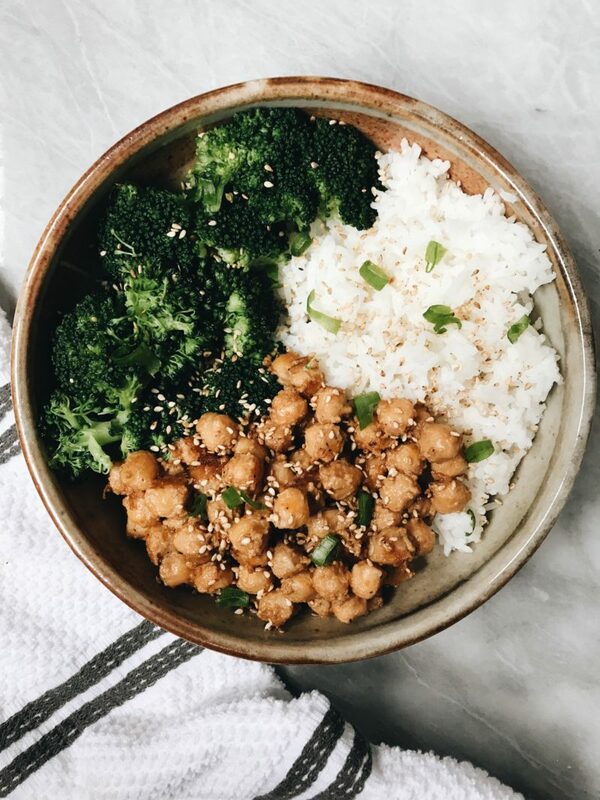 These chickpeas in a delicious sunflower butter sesame sauce will do the trick! Peanut sauce is a very popular ingredient in a lot of dishes. Since I can’t have peanut sauce, I wanted to create my own variation that is allergy friendly. I’ve tried to make a few variations over the years but I finally figured out how I like it. This sauce also doesn’t have to just be for chickpeas. You can try it in tofu, tempeh, rice noodles, etc. However, If you’ve been following me for awhile you know that I absolutely love chickpeas. It’s one of my favorite ways to get in some plant based protein and they’re fun to experiment with in many different recipes. 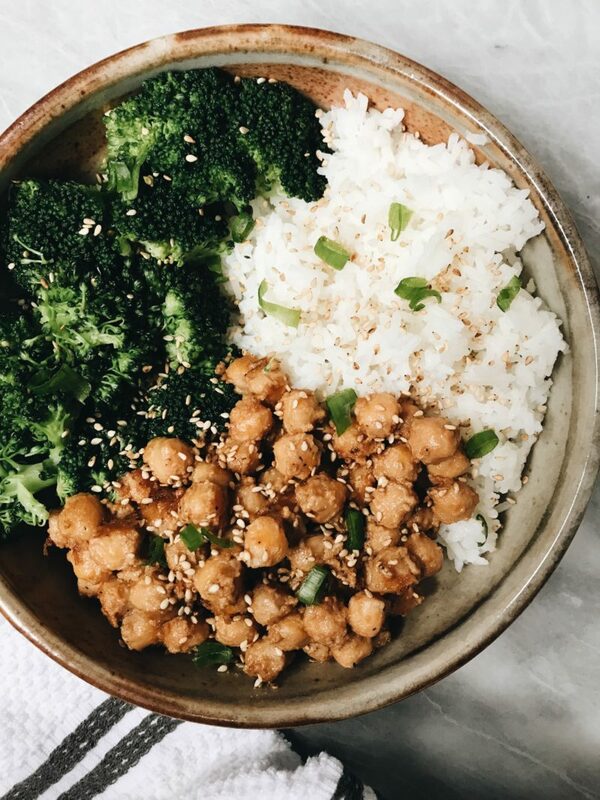 I created this recipe randomly back in January because I was craving some type of “sesame sauce” but didn’t want to tofu/tempeh/etc. I was also craving chickpeas and just decided to give it a go and I was not disappointed with the results. The sauce coated the chickpeas perfectly and it was super creamy and delicious! I have made it plenty of times since so I knew I wanted to share it to the blog. While the recipe is already featured on IG I wanted to make a concrete place for the recipe so it is easy to access whenever you may like. If you search “chickpeas” on my blog, you’ll see a lot of different recipes with chickpeas as the star. 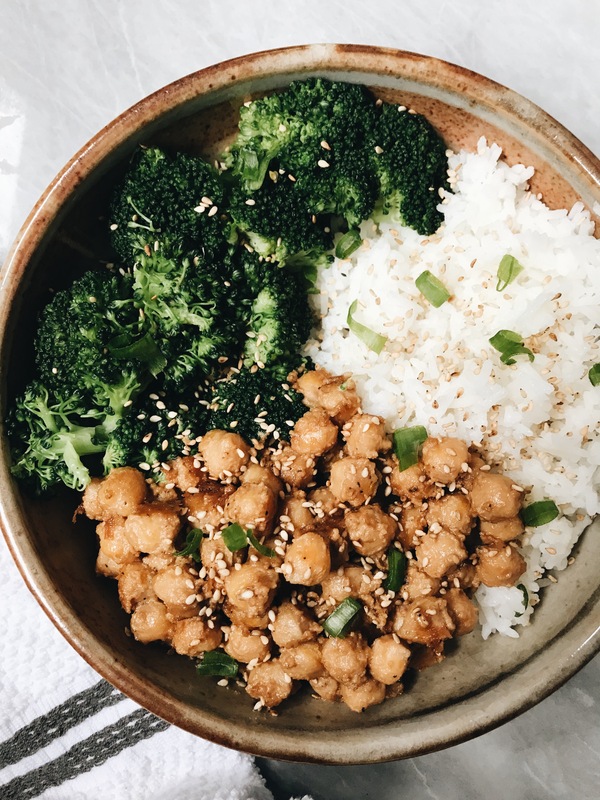 Some of my favorites are: Orange Chickpeas , Creamy Tomato Chickpeas and my Maple Sriracha Chickpeas. Sunflower butter is a great substitute for peanut butter. I personally love Sunbutter but the Trader Joe’s brand is amazing too. What I would recommend is NOT going for sunflower butter with added sugar. I probably wouldn’t recommend chunky sunflower butter either. This recipe also comes together in less than 15 minutes and you can serve it with whatever you like! I personally love the simple broccoli & rice combo but it’s completely up to you for what you’d like to use. Begin by making your sauce. Add all your ingredients (except hot water) in a small bowl and mix to combine. Add hot water gradually (around 2-3 tablespoons) until the sauce is still creamy but slightly runny. Heat your chickpeas in a pan with a little olive oil. Add your salt, pepper & garlic powder and mix so all the chickpeas are coated in the spices. After 2-3 minutes of the chickpeas getting warmed through, add your sauce. Mix constantly for another minute then turn off the heat. The sauce should have thickened up and coated all the chickpeas.